Over the last nine (9) years, Port Moresby has seen transformational changes under my leadership and our collective support and contributions. Many have come forward to support my vision in developing Port Moresby into a prosperous and liveable city that is safe, inclusive, smart and peaceful. Thank you to all at NCDC, the government, the corporate sectors and our people for the momentum that has been generated over the years. Our recent opportunity to showcase Port Moresby to the world through the APEC Leaders Summit provides a good impetus for us to lift our beloved Moresby to the next level. To the level it deserves to be. 2019 will be the pivoting moment for Port Moresby. But before that, it is important to recognise Port Moresby’s achievements over the years. Today, street violence and crime in Port Moresby has been reduced by nearly 60% in the last 9 years, and it remains my major priority to reduce it further. HIV and AIDS prevalence has also reduced from a rate of 1.5% to below 1%. The initiative to meet the standard of compliance by the International Olympic Committee for “Port Moresby to be endorsed as an Active City” status is in a positive trajectory, generating active and physical activities amongst the city dwellers and shifting the people’s health approach from curative to preventive. Corruption is being tackled by its horn and public fund utilisation and awarding of contracts is seeing better accountability, transparency and management. On Education, the National Government’s Tuition Fee Free Education policy has more than doubled the enrolment of school intakes in elementary, primary and secondary education in the city. We are running out of space for our children. Access to basic needs such as water, affordable housing, connectivity through road linkages and infrastructure has seen improvements. Significant international events over the years like the APEC Leaders Summit 2018, Rugby League World Cup 2018, Pacific Games 2015, Under 20 FIFA Women’s World Cup 2016 and others are testimony of the growing importance and recognition of Port Moresby, as a thriving hub in the Pacific. Further, our cultural richness and diversity should never be taken for granted. How many countries in the world can claim to have over a thousand tribes and 800 languages, plus 600 beautiful islands, breathtaking shorelines, majestic undulating hills and mountains and being amongst the largest island in the world? Our global brand and commitment of “Amazing Port Moresby” with the theme One City, One People, One Future Master Plan will soon be launched. Port Moresby’s positioning as a gateway to Papua New Guinea, with our websites and partnerships with the Tourism Promotion Authority is also in place. As Governor of our city, I am working relentlessly to making Port Moresby a peaceful, smart, clean, healthy and a livable city. A city where people want to work, live and invest. Why is this land so pure in her spirits and within her people yet so misrepresented to the world? Today I say enough is enough. Port Moresby will no longer endure or tolerate such an identity. We are resilient, we are peaceful and we are ready to step up and lift our country to a new beginning and the stature it deserves. I believe “The Amazing Port Moresby” initiative with the theme “One City. One People. One Future” is a a real brand promise of a city working hard to make transformational impact not only for her people, but to the world. Despite the negative image and perception of crime and violence of our city, Port Moresby, and her people marches on in our commitment, hope and positivity to improve our settlements, affordable housing, healthcare, education, safety for our women and girls, urban-village ties and others. Our indeginous villages and urban settlements will be the focus of revitalisation in the city. This will require a cultural and political reinvigoration of social engagement in those settlements, and this should be more than just an infrastructure excersie but one that will include education, health and empowerment. We recognise that rapid urbanisation has driven social marginalisation felt by the Motu_Koita people which needs to be addressed. 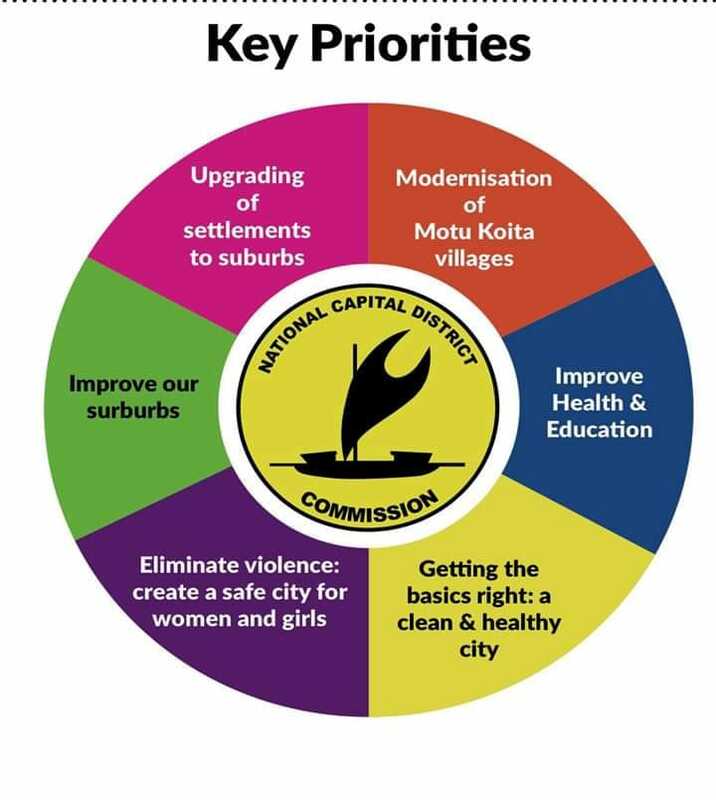 We will continue to work closely with the Motu-Koita assembly and my deputy to ensure that no one is left behind in our growing city. Further to this, I will also be upgrading all NCDC communications machinery so we are able to engage with you, our most important stakeholders and beneficiaries, more effectively and in a timely manner. We will revamp our website to ensure that it is updated and engaging. To further support the momentum we will generate locally, NCDC will also be investing in telling our Amazing Port Moresby story to the world through international profiling of Port Moresby where we hope to impact and improve our global cities and liveability indexes. Finally, I promise a better experience to our people by having a well organized and exciting flagship events that all our people look forward to. Key flagship events like Christmas, New Year and Hiri Moale Festival that will attract international media, tourism influencers and tourist arrivals. Our calendar of events that recognises urban-village ties, and promotes integration, cultural sensitivity, of high quality and standards, safe and fun for our families. As your Governor, I will not be able to do all of this alone. Join me in making 2019 an amazing year for our Amazing Port Moresby. I reach out to you, our people, our corporate partners and friends in Port Moresby, to join me to lift Port Moresby to the next level. We want to be prosperous, safe, productive and celebrating our nature and diversity. Port Moresby is at a tipping point of success and the time is NOW. I wish us all a prosperous and successful 2019.